Our Fluval Spec V aquarium, in its current state, is my first attempt with live aquarium plants. 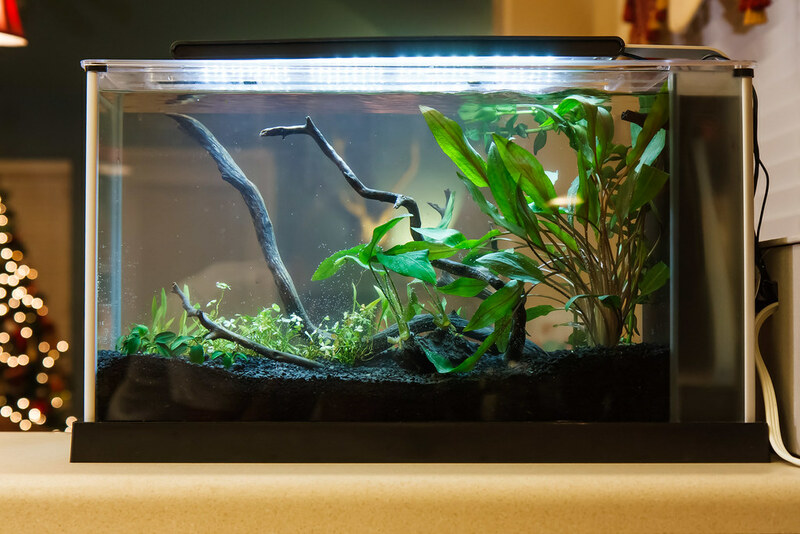 One early lesson that I had to learn about obtaining and planting aquarium plants is the difference between emersed and submersed growth plants. What does Emersed and Submsersed Mean? the substrate/roots. The plant stems and leaves grow fully exposed to air. 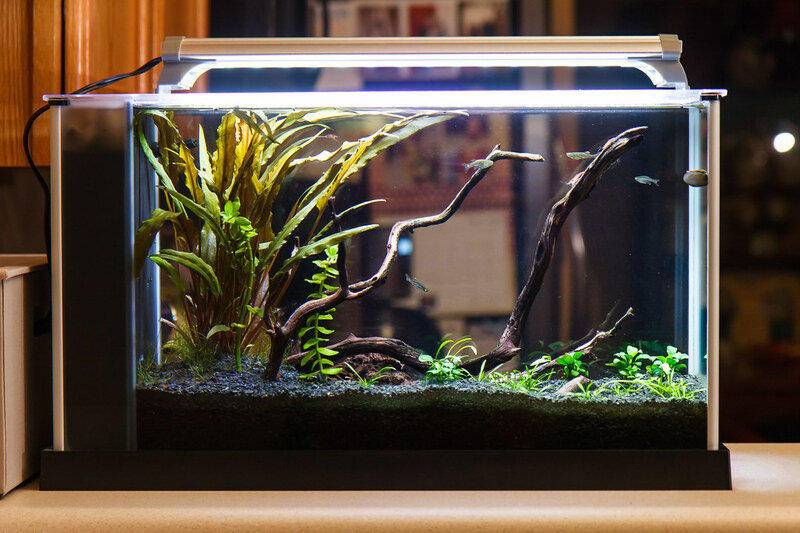 The opposite scenario for aquarium plants is Submersed or Immersed (the two words are interchangeable in this situation). This is what most of us are going for: auqairum plants that grow completely below the water line and are fully submerged. 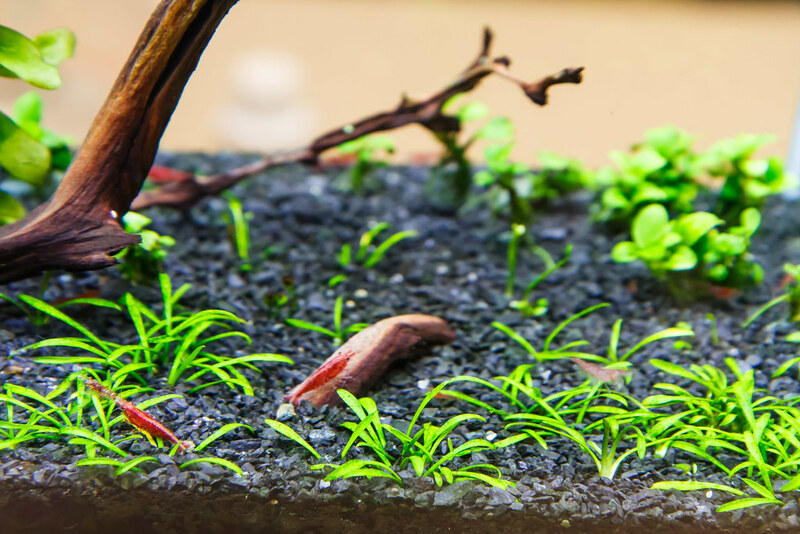 How are Emersed and Submersed Aquarium Plants Different? 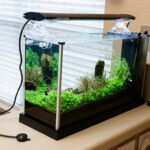 Know that plants that are currently emersed can generally be transitioned to submersed (immersed) and vice versa. However, there are physiological difference in the plant’s leaf structure that make this transition difficult. How difficult varies from plant to plant. The basis for the difference in leaf structures between emersed and submersed growth comes down to nutrient transfer and respiration. Emersed growth plants have direct contact with a supply of air with all the CO2 it could need. Conversely, a plant underwater in submersed growth has to transfer CO2 and Oxygen throught the limits of what can be dissolved in the water column. The limits to CO2 in the water colum leads to a dramatically different leaf structure. Aquarium plants that are grown and sold as Emersed, having leaves that are acclimated to air, are sometimes more vibrant in green coloration compared to a submersed example. The leaves are sometimes a different shape and texture. 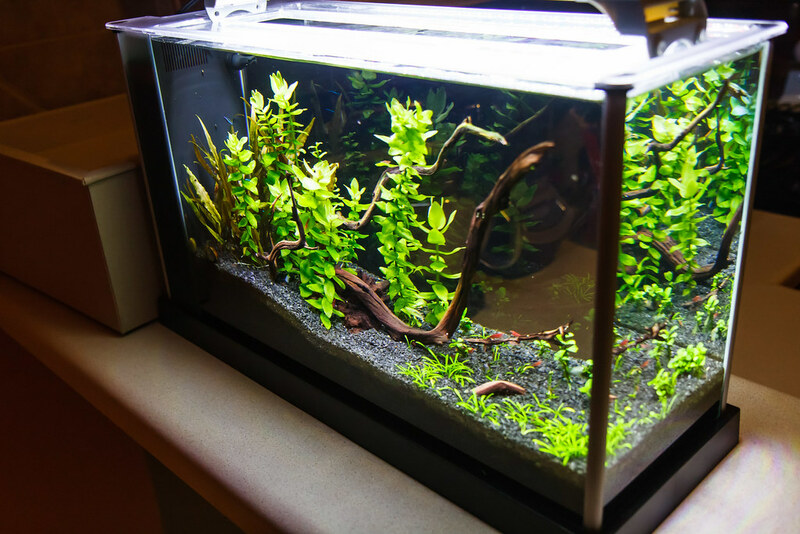 I obtained the following plants in our first batch that I planted; I believe most if not all were grown emersed: Cryptocoryne Undulata, Cruptocoryne Parva, Bacopa Caroliniana, Marsilea Hirsuta, Anubias Barteri Var. Nana, and Annubias Nana Petite. Of these, the ones that had the most dramatic differences transitioning from Emersed to Immersed conditions were both the Cryptocoryne varieties and the Marsilea Hirsuta. 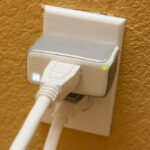 Here are some example pictures. This is right after planting. Let’s take note of the Cryptocoryne Undulata (right hand side below). I did not even recognize the plant when I got it unwrapped from shipping. It was advertised as 6″ to 8″ (15.2 cm to 20.3 cm)tall with brown/red tinted leaves with wavy edges. The plant came with large, bright green leaves. The leaf texture was smooth and the leaves were shaped in ovals. 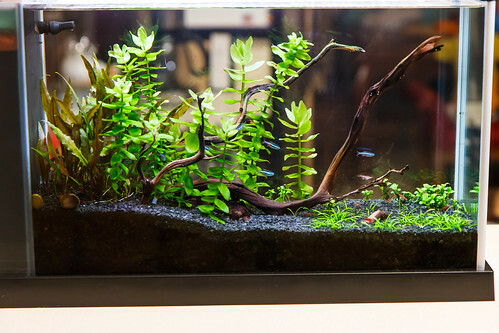 Immediately after adding to our aquarium, much of the plant’s leaves started to ‘melt’ or desenigrate. I started to cut the worst leaves off at the base. Over time, new growth came up as I cut more and more off. 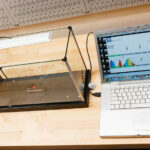 Here is a picture four months later (cryptocoryne now on the left hand side). Notice that some leaves have already transitioned – the coloring is closer to brown and the leaf edges are curling as expected. Here is a picture of the plant currently nine months after initial planting. The leaves have not changed much in color or texture since the previous picture, but the plant is now shorter at its final height. A similar transition occured with the Cryptocoryne Parva. It’s leaves were larger, sat upright, and were bright green. Here is a picture right after planting. The leaves did not melt like the Cryptocoryne Undulata; however, over time, the leaves became smaller in size and sat much lower to the substrate. Here is a picture of the Parva currently nine months after initial planting. Why are Aquarium Plants Predominantly Sold as Emersed Growth? Plants are robust and attractive in appearance. 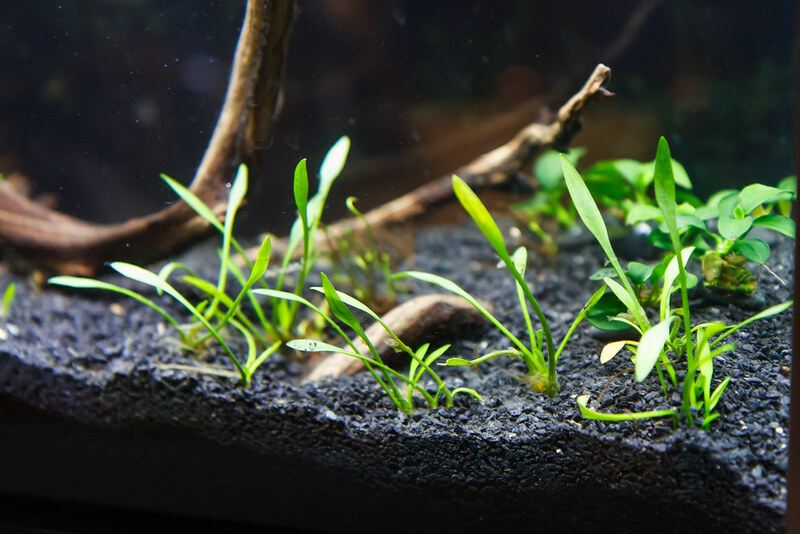 The only real con to producing emersed growth aquarium plants is that the plants will have a tough time transitioning with the end user. The positives far outweigh any negatives from a nursery owner’s prospective, and this is why it has become the industry norm. Simple cost and the desire to deliver attractive, tough plants. 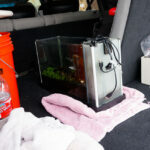 As I was shopping for items in our nano tank, I went by a local fish store that is otherwise a great store in our area. I was terribly disspointed in the quality of the plants that they had. Algae growth on everything, melting leaves; just not very impressive and not what I wanted. I verified the same thing in other stores – plants in poor condition. I did not at the time understand that these problems were symptoms of plants that were having to transition from emersed to immersed growth. Their source for plants are nurseries similar to the ones you may obtain plants from online. There was no difference between what my mail-ordered plants experienced and what I observed in the store bought plants. Unfortunately, retaillers do not have the ability to store plants for 2-6 months to fully transition them to submersed growth and then present to the customers. Also, I have observed most aquarium shops do not pay the cost of CO2 injection into their plant tanks. The result is predictable in that the plants suffer from algae on the leaves. Now understanding the changes occuring, I am not as hard on the retaillers and the conditions of their plants. I know that if given time and a new home, most of those plants will rebound nicely, just like the ones that I ordered from the internet. 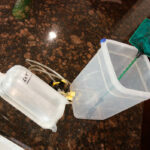 provide good water conditions for the plants (appropriate temperature). The last point, time, is the most critical. In the case of the Cryptocoryne undulata, it was not fully aclimated for 8 months! That is patience that I am having to learn in so important for this hobby. Pruning is also the biggest thing you can to do help a transitioning plant along. Every plant has different needs, but in general, prune leaves that have significant melting or that have excessive algae growth. I was way too slow to cut leaves/stems off in the beginning. Most plants are very responsive to a heavy pruning and can handle more than you would think. Don’t whack all the leaves off at once, but take care of the worst systematically to encourage new growth; growth that will be fully suitable for a submersed plant. 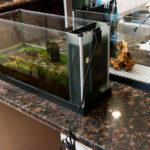 This entry was posted in Planted Aquariums and tagged aquarium plants, emersed, melt, submerged, submersed, transition. Bookmark the permalink. You bet! It is unnerving watching them transition – best of luck! What an informative article! My only complaint is I didn’t find it sooner! Thank you for the explanations and the pictures are always so helpful. A reviewer said they could tell the plant was grown emersed and I had no clue how they could tell! Thank you so much! If you gain benefit from my work on this site and want to give back, purchase anything you wish from the Amazon link below and I get a small percentage back. Thanks!